Kathleen Stephansen is an Independent Trustee to the AXA-Equitable Mutual Funds and Senior Economic Advisor to the Boston Consulting Group Henderson Institute Center for Macroeconomics. She is the former Chief Economist of Huawei Technologies, Chief Economist of the American International Group (AIG) and AIG Asset Management’s Senior Investment Strategist and Global Head of Sovereign Research. Prior to joining AIG in 2010, Kathleen was Chief Economist at Aladdin Capital Holdings, Credit Suisse’s Head of Global Economic Research, and Donaldson, Lufkin and Jenrette Securities Corporation’s co-head of Fixed Income economic research and Chief International Economist. She has served as the chair of AIG’s Parent Model Governance Oversight Committee and as member of AIG’s Investment Committee and AIG’s Retirement Investment Committee. 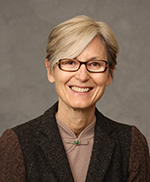 Kathleen serves on the boards of the Global Interdependence Center (GIC) and Economists for Peace and Security (EPS) and is a former board member of the National Association of Business Economics (NABE). She is a member of Chatham House and the Economic Club of New York.